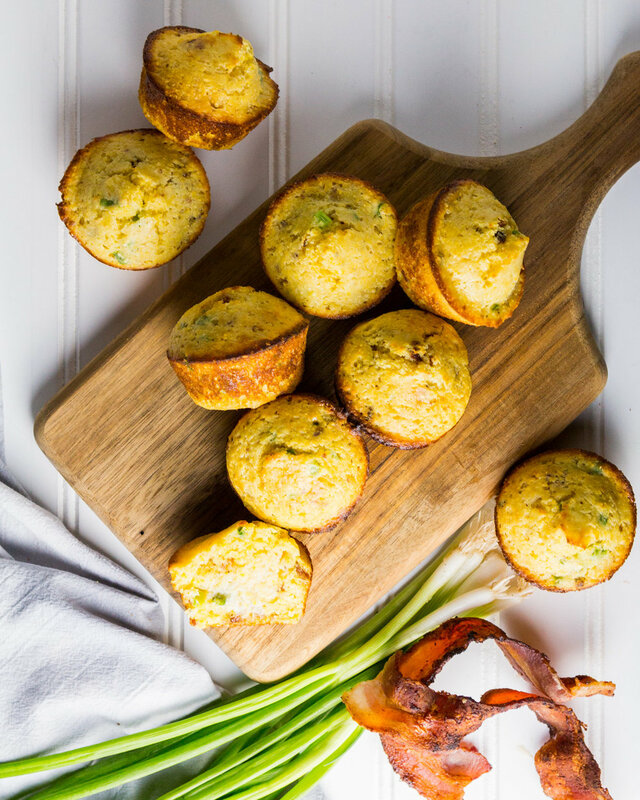 Cornbread Muffins with Bacon and Scallions — knead. bake. cook. These cornbread muffins were the perfect subject because they held their heat for quite some time, until they were split open. I always have loved cornbread (and most breads) with butter so I couldn’t resist trying to photograph the melting effect of that as well. 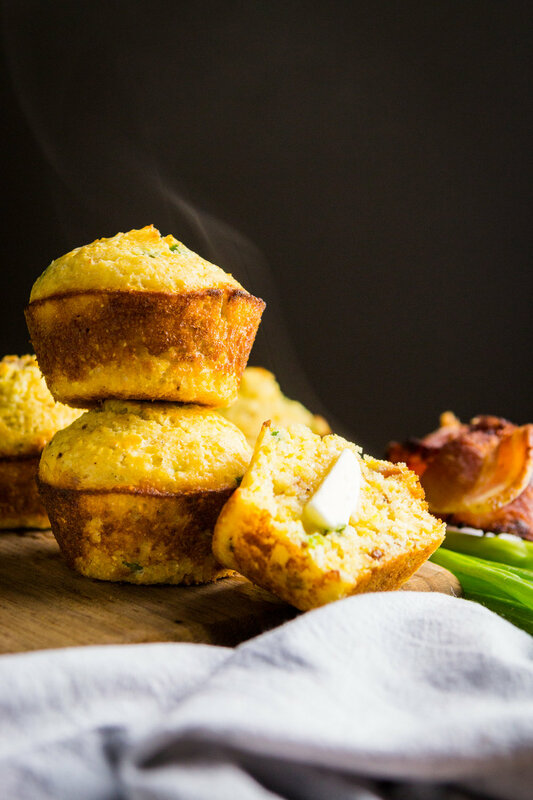 I grew up with savory cornbread that has a more “bready” texture than “cakey” texture so that is the type of cornbread muffin I am sharing here. The secret to a good cornbread texture is to not overmix the batter and work quickly. You want to incorporate the wet ingredients into the dry ingredients just until the dry ingredients are moistened and then stop there. And lastly, pull them out of the oven right when they are baked through. I added bacon and scallions to these for an extra savory component but feel free to omit them if you want to go for a more classic flavor. My favorite bite is the one where the butter has soaked through. Preheat oven to 425ºF. Spray a muffin pan and set aside. Sift dry ingredients into a large mixing bowl. 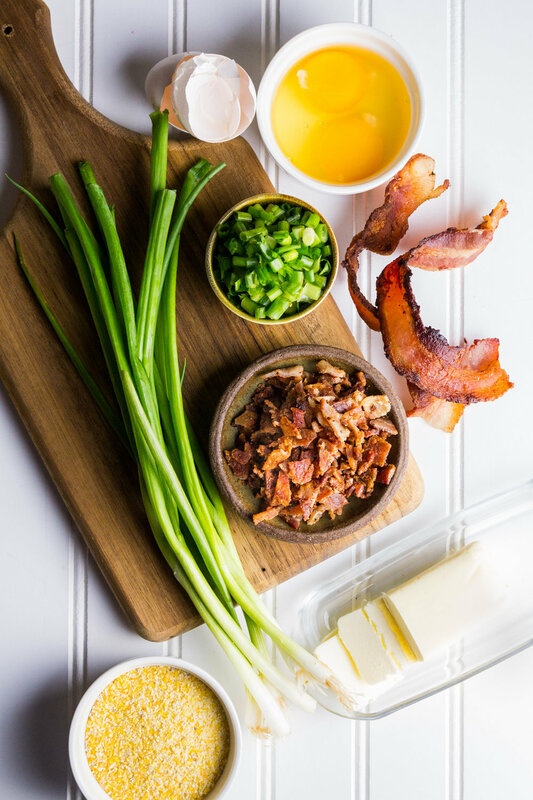 Toss bacon pieces and green onions in the dry ingredients to coat. In a medium bowl, combine the milk, eggs and butter, stirring until well blended. With a rubber spatula, make a well in the dry ingredients. Pour milk mixture in all at once. Stir quickly to just moisten the dry ingredients. Do not overmix. Having some clumps that are not incorporated is okay. Pour batter into muffin tins and bake for 15-18 minutes or until a toothpick inserted comes out clean. Serve immediately with butter if desired.